This section about the Mormon Church will discuss other topics relative to the Mormon Church including some that frequently attract the attention of the public, but that are not well understood by many who are not familiar with the teachings of the Mormon Church. 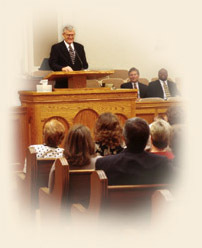 To properly undertand these topics sometimes it is necessary a basic understanding of Mormon doctrines, but not always. If you need a better understanding of some basic principle please review the section “Basic Mormon Beliefs“. At any point in this process of learning more about the Mormon Church you can feel the desire to know more about it or to talk with someone who can answer all your questions. If this is the case, you can always contact someone in your area who will be able to help you understand better. You may also request a free copy of the Book of Mormon or download Church publications in compressed audio format (including music). Marriage and Families are Ordained of God: God created the first family and had good reason for doing so. Mormon Women Taught to Learn the Why of the Gospel: Mormon women were taught in a meeting not to blindly obey the gospel. Instead, they are to understand why they are asked to do things.